Featuring a shortened body that measures barely 25 inches in length, this compact sound bar installs unobtrusively in bedrooms and small environments and fills them with a loud sound that won’t distort. This size is more suitable for small TV and small space. 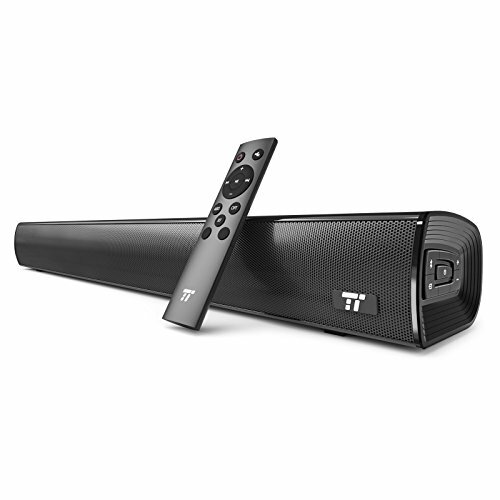 Depending on your TV model and home theater setup, the TaoTronics Wall Mountable Sound Bar pairs via Bluetooth from up to 33 ft / 10 m or connects with the in-unit 3.5 mm, RCA, and optical inputs. Should you opt for a wired setup, the included optical cord provides a more pure, unaltered audio reproduction. No longer do you need to move your room’s furniture around to further enrich your home theater setup. The TaoTronics Sound Bar can be set below the screen or conveniently mount onto the wall for a minimalist, sleek appearance. Even the most advanced technology can be easy to operate with a fully functional, intuitive remote control. TaoTronics includes a high-sensitivity IR remote that displays the different modes by means of differently colored LED lights. 25" Sound Bar: No need to have a spacious living room to enjoy better audio playback! This compact soundbar installs unobtrusively in bedrooms and small environments.